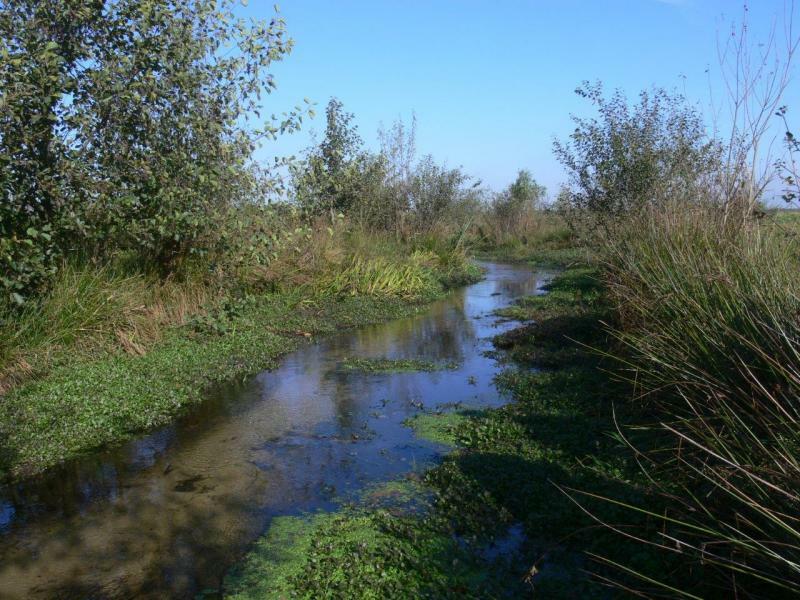 For young scientists and Ph.D. students a summer school on "Restoring Regulated Streams Linking Theory and Practice" is organised (27-29 June 2015, Wageningen, the Netherlands). 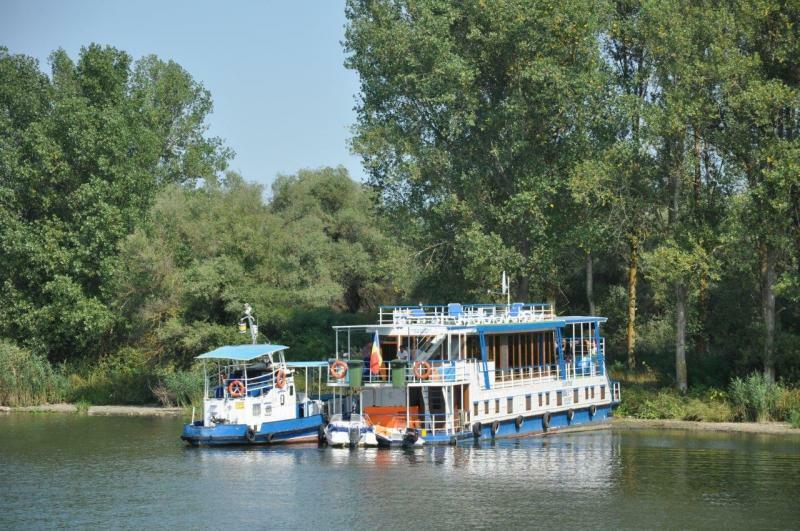 The summer school is immediately followed by our International Conference “Novel Approaches to Assess and Rehabilitate Modified Rivers” from June 30 to July 2, 2015, also to be held in Wageningen. The programme of the conference will feature 13 excellent keynotes and over 50 regular presentations. The registration is open and special hotel rates are available until early May. If you are interested then do not wait too long to register and visit the conference website . 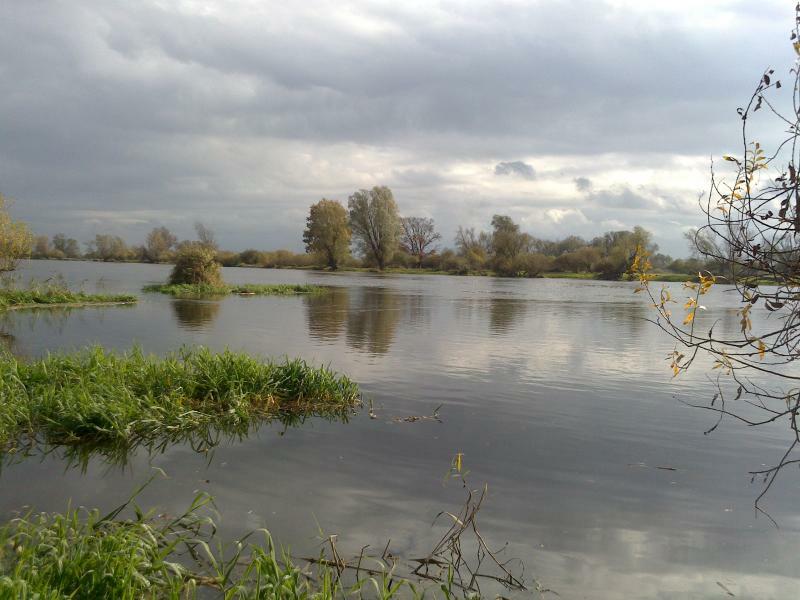 In September 2015, REFORM will also organise a workshop by invitation to address sediment management in connection with environmental flows. 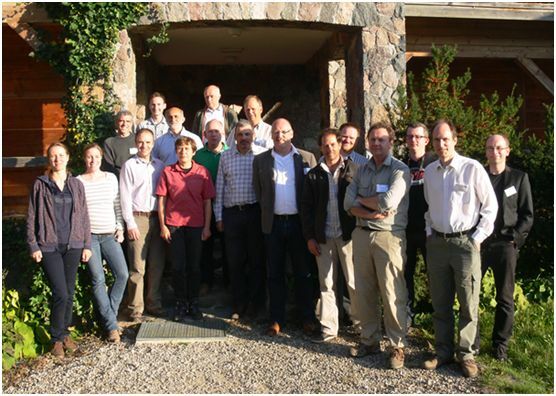 Finally, the working group ECOSTAT of the WFD Common Implementation Strategy plans to host a workshop on hydromorphology in connection to ecological status in October 2015 to which REFORM will contribute. p.s. If you do not yet receive our newsletter automatically and are interested to do so, then please visit our home page (www.reformrivers.eu ) where you can subscribe. In the context of REFORM WP4, we compiled a harmonized dataset on the effects of hydromorphological river restoration measures on a broad range of response variables including habitat composition in the river and its floodplain, three aquatic and two floodplain-inhabiting organism groups, as well as food web composition and aquatic land interactions as reflected by stable isotopes. Additional data on factors potentially constraining or enhancing the effect of restoration were compiled to identify conditions which favour restoration success. 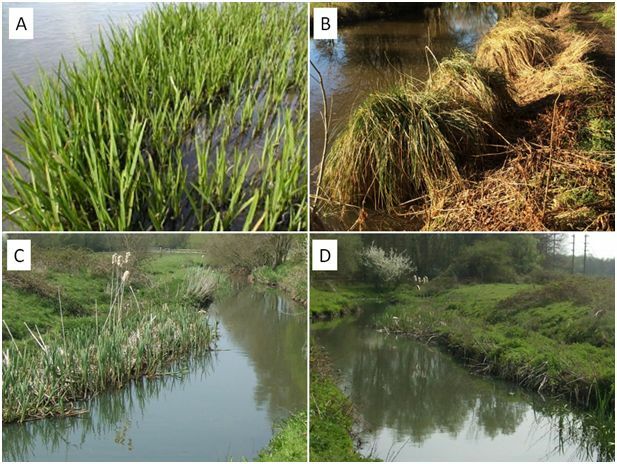 Ten pairs of one large and a similar but small restoration project were investigated to especially address the role of restoration extent for river restoration effects. The restoration effect was quantified by comparing each of the 20 restored river sections to a nearby non-restored, i.e. still degraded section. More organism groups (aquatic AND semi-aquatic / floodplain inhabiting) should be considered in the monitoring and assessment of river restoration projects. Restoration had an overall positive effect on hydromorphology, especially on macro- and mesohabitat diversity (e.g. number of islands, bars, pools) but a low effect on microscale substrate composition. Microhabitat diversity was correlated with macroinvertebrate richness and diversity; ground beetle richness was not correlated with habitat diversity but related to specific pioneer habitats. Key indicators for identifying restoration success should include parameters at larger spatial scales such as channel adjustments. While restoration projects like widening are visually appealing and increase macro- and mesohabitat diversity, they potentially fail to increase microhabitat diversity relevant for macroinvertebrates. It is important to ensure that habitats at relevant spatial scales or processes that create such habitats are restored. For some organism groups (e.g. ground beetles), it is more important to re-establish specific pioneer habitats and to restore processes to sustain these habitats over the long-term than to increase the mere number of habitats. Restoration effects on community structure, traits, and functional indicators were generally more pronounced compared to the effects on species number and diversity. Future restoration projects and monitoring studies should focus more on functional aspects (e.g. species traits, community structure) to investigate functional changes caused by river restoration, infer causal relationships, and identify restoration measures with large effects on ecosystem functions. Restoration effects depended on the effect of restoration on aquatic substrate diversity, were especially high in widening projects and depended less on catchment land use and restored reach length. Restoration effects were not mainly limited by land use and might have been rather constrained by the limited species pool available for re-colonization since the organism groups which benefited most also have relatively high dispersal abilities (ground beetles, macrophytes). This clearly merits further investigation since it would need a completely different restoration strategy compared to reach-scale habitat improvements. Probably, even the large restoration projects in our study were simply too small to benefit from possible positive effects of restoration extent, an observation which is also supported by other recent studies. The high effect of widening projects is consistent with other studies and the widely endorsed assumption that restoring geomorphological processes has a higher effect compared to other measures. Since widening includes a set of measures, it has to be further investigated which specific measures drive the high effects. Besides, these results do not question the use of instream measures. Several other studies reported positive effects of instream measures, while our study had a relatively low number of instream projects and thus a limited universality. 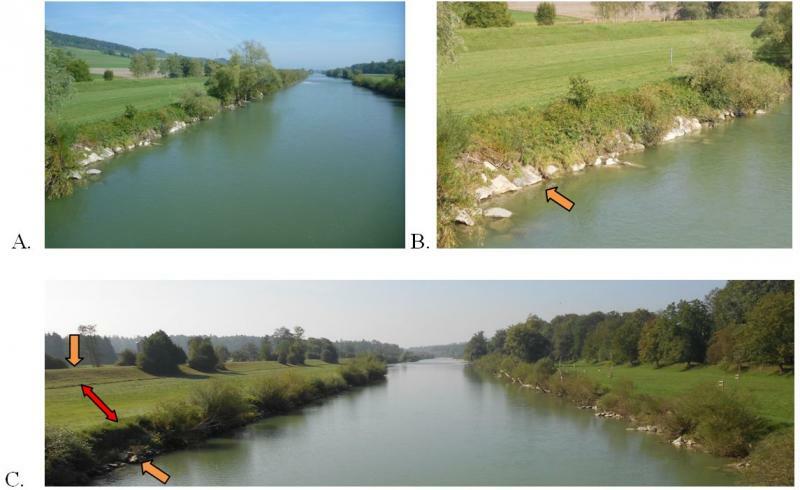 The 20 restoration projects investigated in this study were representing good-practice examples in Northern, Eastern and Central Europe, reflecting the relatively long tradition in river restoration in these regions. Regional differences have to be considered when applying these results to other river types and regions (e.g. large or Mediterranean rivers). In our 3rd newsletter , we highlighted the importance of adopting a hierarchical, multi-scale, approach to river hydromorphological assessment. We explained that this is important because the shape and behaviour of a river, as well as the landforms it creates and the habitats that it supports, are controlled by processes at a wide range of spatial scales. In other words, what we see within a river reach is the result of a cascade of influences from further upstream and downstream in the catchment. Information concerning the REFORM spatial hierarchical framework is now available as Deliverable 2.1, which is comprised of four volumes or parts: an overview of the framework (part 1); some more detailed discussion of some of its components (part 2); and two parts (3 and 4) illustrating applications of the framework to a selection of river catchments from different geographical areas of Europe. The four parts can be downloaded here . Another crucial aspect of hydromorphology that is too often neglected, is the influence of vegetation on river channel form and dynamics. Riparian vegetation is not included as a biological quality element in the Water Framework Directive, and yet research conducted over the last 20 years has clearly shown that riparian vegetation has a fundamental influence on the hydromorphology of rivers and their floodplains, with a geographically more widespread impact than aquatic vegetation. 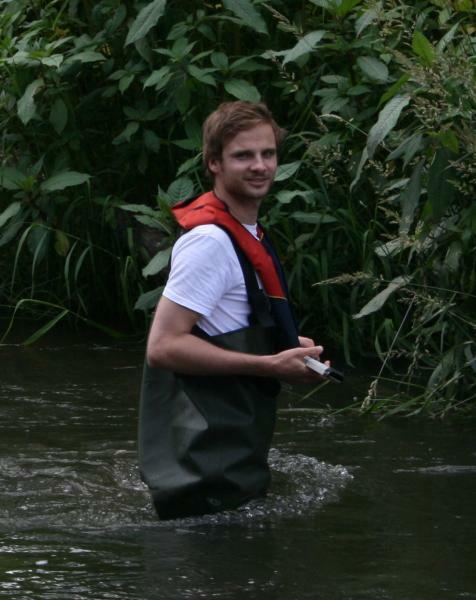 Within the REFORM project, we have assembled evidence from published sources and available data sets to illustrate how vegetation interacts with hydromorphology to constrain numerous aspects of river morphology and dynamics, so providing a vital component of any river management and restoration efforts. Our findings are reported in Deliverable 2.2 part 1, which can also be downloaded here . Here, we briefly focus on a conceptual model of vegetation-hydromorphology interactions that we have developed and tested in several catchments across Europe. The model highlights the natural functioning of vegetation as a control on river hydromorphology, indicating that if vegetation is heavily managed, the hydromorphological character of the river will change. If vegetation is allowed to colonise freely, it will accelerate river channel recovery from management interventions. Vegetation interacts with hydromorphological processes. From one perspective, vegetation is constrained by hydromorphological processes that reflect the climate, moisture availability and physical disturbances to which the vegetation is subjected. These constraints operate over the different spatial scales of the hierarchical, multi-scale framework (Table 1). Against this background, vegetation within river channels and floodplains is very heavily affected by fluvial disturbances, such that only certain species can colonise the most disturbed parts of the river corridor. Table 1: Hydromorphological processes and related factors reflecting climate , moisture availability and degree of fluvial disturbance, that constrain the plant species and communities that can occupy the spatial units found within river catchments. 3D position with respect to active channel, erosion resistance and stability. In moist environments, a zone of perennially-flowing water is present in the low flow channel (zone 1). Beyond this, the frequency, duration and depth of inundation decreases towards the outer limits of the river corridor (the outer edge of the floodplain and the base of bordering hillslopes). Within zone 2, inundation is frequent, deep, and prolonged, leading to relatively high flow velocities and shear stresses and so a high potential for the flowing water to erode, transport and deposit sediment and also to damage, uproot or bury plants. With increasing distance from the river (zone 3), inundation depth, duration and frequency decrease, reducing the potential for sediment erosion and transport, and leading to a progressive fining of transported and deposited sediment coupled with an increase in its organic content until, in zone 4, sediment dynamics are negligible during inundation. In zone 5, which includes the most elevated areas of the river corridor, and those that are most remote from the perennial channel, inundation is extremely rare and subsurface water dynamics become the dominant control on vegetation. The relative size of these five zones varies greatly from river source to mouth and with the width of the river corridor. The relative proportions of the river corridor that the zones occupy also vary with the type of river that is being considered (Figure 2). 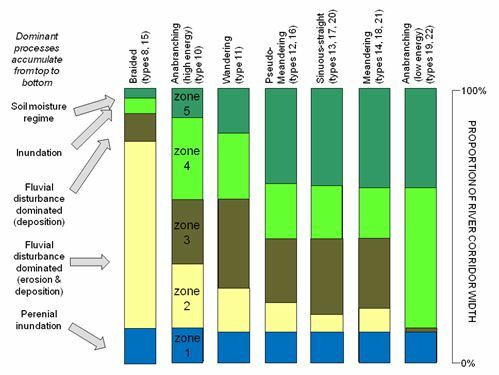 Figure 1: Schematic representation of the five zones of natural vegetation- hydromorphology interactions in river corridors of different confinement and width from the source to mouth of a river. Figure 2: Schematic representation of the proportions of the width of a floodplain river corridor that may be occupied by the five zones of natural vegetation- hydromorphology interactions according to the type of river channel that is present. These five zones are subject to different vegetation – hydromorphology interactions, and the nature of the interactions also varies according to the biogeographical region in which the river is located. However, in all cases, there is a critical zone of very tight and strong interactions that is important for understanding the consequences of vegetation management and recovery for river channel form and adjustment. This critical zone bridges river corridor zones 1 to 3 and is a zone where certain plant species can act as physical ecosystem engineers, colonising bare river sediment surfaces and then trapping transported sediments as the plants grow. In this way, the plants create landforms that can then be colonised by other plant species. Riparian tree species and rigid, emergent, aquatic plant species can often take on this role, and very large pieces of dead wood can often contribute by acting as retention structures for plant seeds and plant fragments that can sprout. 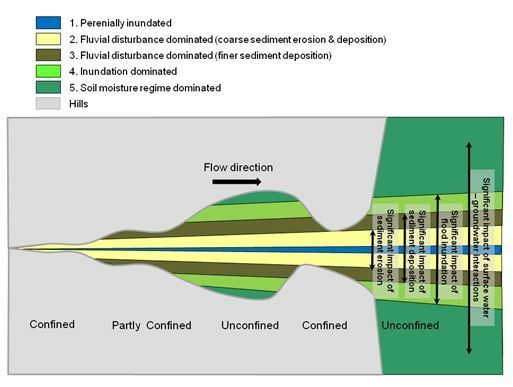 The engineer plants and the landforms that they create are located in the critical zone of intense plant-hydromorphology interactions, where they may be removed by the force of extreme floods but where they also colonise eroded areas and extend towards and into the channel during periods of less intense river flow disturbances. If these plants and any associated wood pieces are removed or cut back, this allows fluvial processes to push back the leading edge of the vegetation, increasing river bank erosion, widening the channel, and reducing the habitat complexity of the river channel and its riparian margins. In severe circumstances this can lead to a change in river type. For example, in extreme cases river channels have been observed to change from single thread to braided as a result of degradation of floodplain vegetation cover. The photographs in Figures 3, 4 and 5 illustrate a small sample of the landforms that plants can create within the critical zone of the river corridor. The presence of such pioneer vegetated landforms, indicates the leading edge of vegetation-hydromorphology interactions that is so critical for river size and dynamics, and also for the diversity of the habitat mosaic that is available within the river ecosystem. Figure 3: Early stage landforms built around sprouting uprooted trees, branches and tree seedlings. A. Pioneer island centred on a single uprooted and deposited tree. B. a building island which forms when a feature similar to A traps large quantities of fine sediment and grows through the sediment to form a large mound-like feature. C. a levee-like feature created by fine sediment accumulating around a line of tree seedling at the edge of the low flow channel. D. sprouting uprooted trees and branches trapping sediment and growing to give a sequence of ridges of increasing size and tree age parallel to the edge of the channel and usually on the inside of river bends (photos: Angela Gurnell). Figure 4: An evolutionary sequence of landforms created by emergent aquatic plants trapping and reinforcing fine sediment. A. a submerged shelf of fine sediment on the channel bed, formed around the base of a stand of aquatic plants. B. a submerged shelf, similar to A. but retained by tussock-forming aquatic plants. C. a berm formed by further sedimentation of features such as those in A and B, but now the sediment surface has aggraded to the low flow water surface level. D. a bench formed by further sedimentation of a berm feature such as that in C so that the surface is now located well above the low flow water surface level (photos: Angela Gurnell). Figure 5: A. vegetated bars and islands created by sediment trapping and reinforcement by aquatic plants in a similar manner to the features shown in Figure 5. B. a river bank composed entirely of decaying plant material and reinforced by aquatic and wetland plants (photos: Angela Gurnell). Consequently, managers are required to change the way European waters are managed, especially as the ecological status of rivers is likely to change with climate. 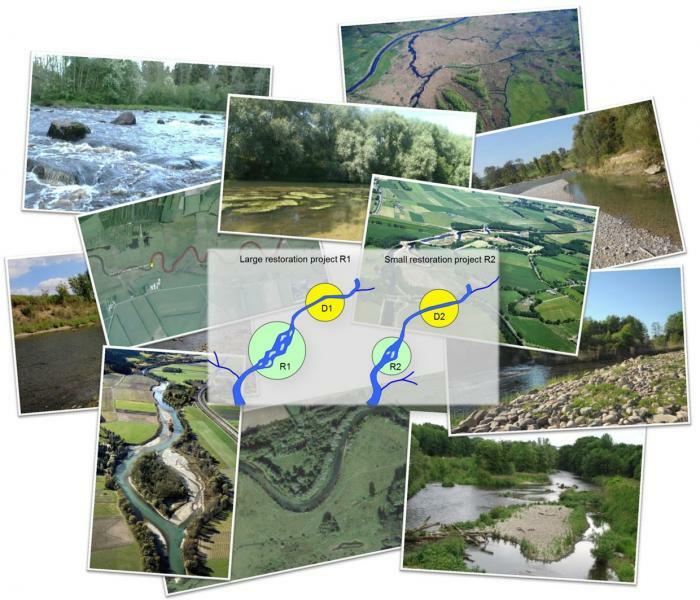 In the context of REFORM WP5 on restoration potential and strategies (http://reformrivers.eu/results/restoration-potential-and-strategy ), we propose adopting a ‘synergistic and trade-off’ approach to river restoration through the application of the DPSIR (Drivers, Pressures, States, Impacts, Responses) framework, with specific focus on soft engineering techniques i.e. nature-based solutions where possible, to reduce the effects of climate change. This will enable river managers to consider the links in integrated freshwater conservation planning and overcome constraints that might hinder other (or multiple) sectors. Bennett E.M., Peterson G.D. & Gordon L.G. 2009. Understanding relationships among multiple ecosystem services. Ecology Letters 12:1394–1404. http://dx.doi.org/10 .1111/j.1461-0248.2009.01387 . Wetlands are one of the most important and productive natural ecosystems on Earth. They play a significant role for the functionality of whole ecosystems and human wellbeing (e.g. role in water cycle, carbon storage, wildlife refuge). Wetlands have economic, cultural and touristic values providing numerous of benefits to people, called ecosystem services. Nowadays most of these ecosystems are degraded so there is need to restore them. Proper management of wetlands is crucial to protect and increase the values of these ecosystems and hence also ecosystem services. Therefore, a valorization of ecosystem services of restored areas is important to assess the performance of restoration projects and improve their implementation by choosing the best scenario. The main aim of this PhD research is to assess restoration projects using the ecosystem services approach. This assessment is meant to show whether the project objectives have been achieved. The information about benefits obtained from wetlands should be considered in the future performance of restoration projects. Different alternative scenarios for restoration will be developed, aiming to support better decision-making in restoration planning. 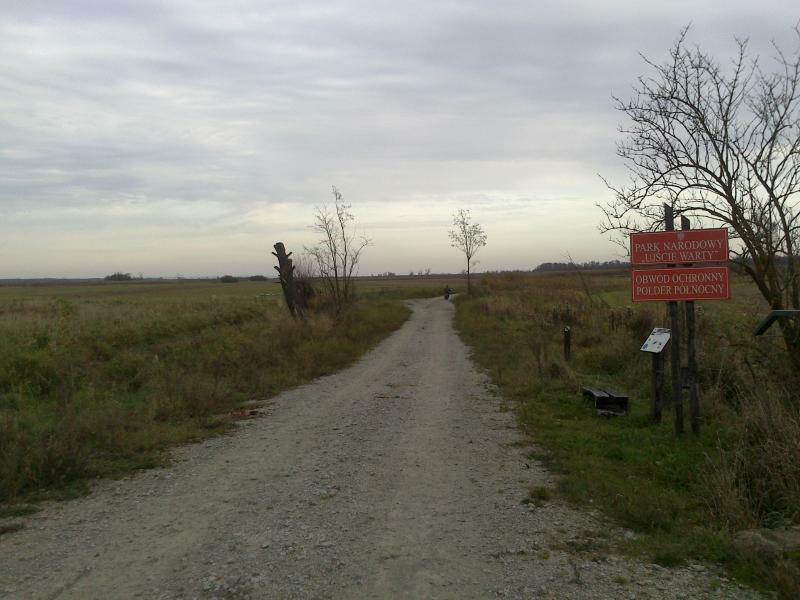 Three different wetlands were chosen for this PhD research in the Biebrza National Park, the Kampinos National Park and the Warta Mouth National Park. This article is concerned with the evaluation of The North Polder in the Warta Mouth National Park (see photos) which is one of the REFORM project case study sites. 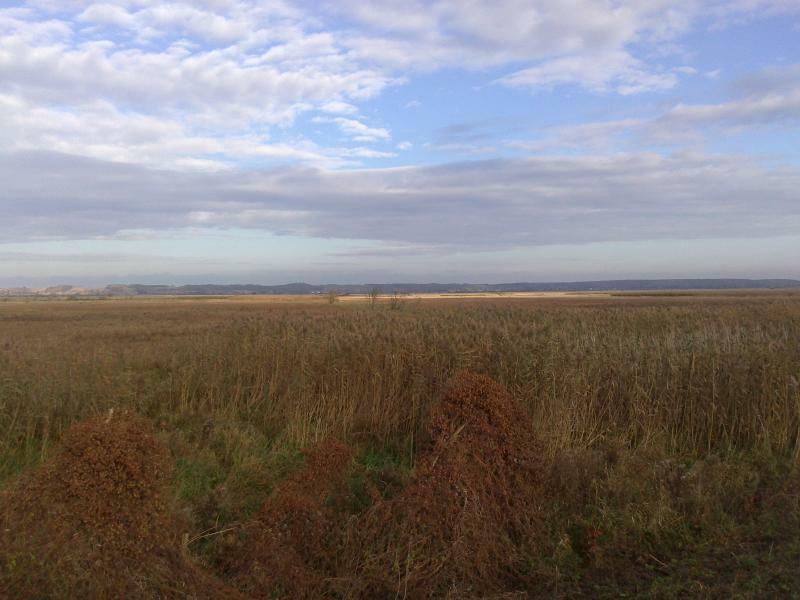 The „Project of revitalization of wet-meadow habitats in the Warta Mouth National Park – North Polder Wetlands are good!” mainly aims at restoring wetland habitats in conjunction with extensive grazing management and flood control function of the North Polder. The main threat to the natural values of this area is very strong desiccation. This process leads to soil degradation and secondary succession of vegetation on meadows and pastures unused by farmers. Water scarcity and willow thickets emerging in the southern part of the polder as well as herbs in the northern part, significantly contribute to the loss of valuable habitats which serve as breeding places for many rare and endangered species of birds. Ecosystem services will be assessed before and as far as possible after the restoration project is finished. Ecosystem services (quality and quantity) will be evaluated based on 4 issues: hydrology, carbon in the soil, functional diversity and socio-economic aspects. 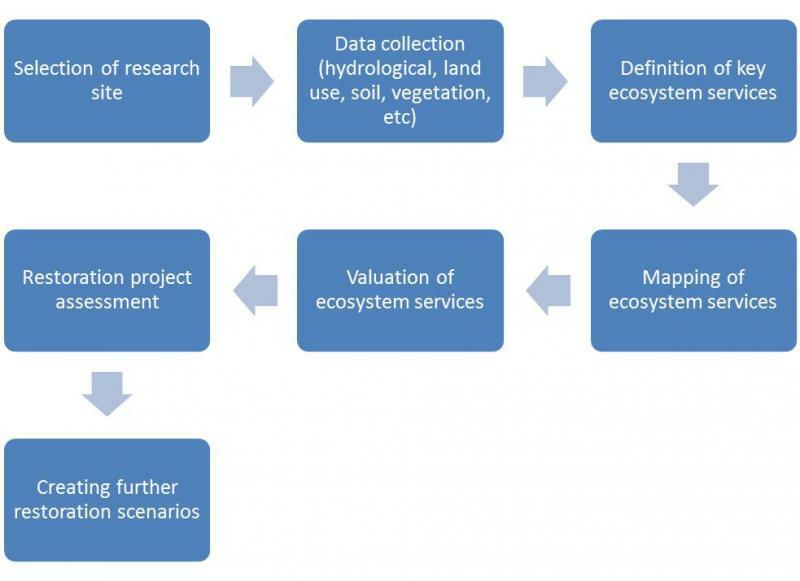 All evaluated ecosystem services will be mapped and compiled. The compilation allows finding hot spots of the most important ecosystem services. Based on preliminary research on available metadata, a table with ecosystem services significant for this area has been created (Table 1). 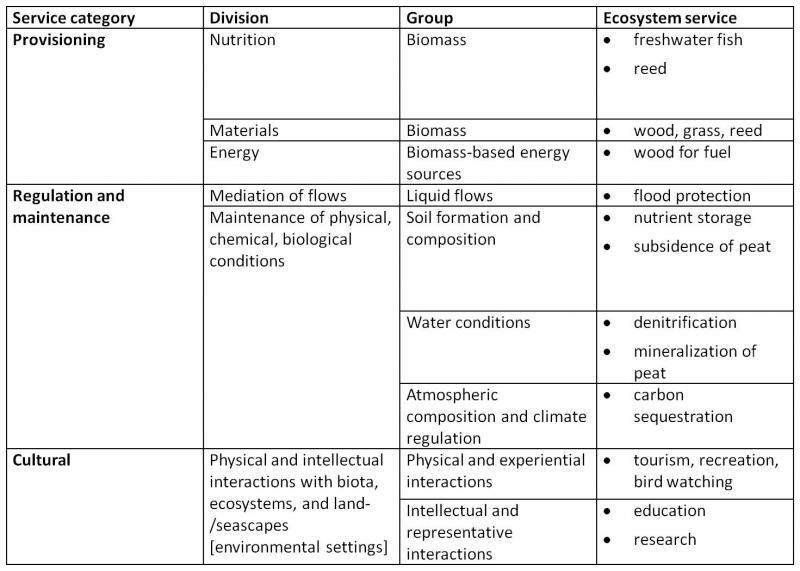 The table is based on the Common International Classification of Ecosystem Services (CICES). It consists of three general types of ecosystem services: provisioning, regulating and cultural. After collecting detailed information, all types will be analyzed to choose the most important ecosystem services for wetlands. Table 1: Ecosystem services based on CICES classification. Further work will allow assessing ecosystem services in terms of the four issues mentioned above (hydrology, carbon in the soil, functional diversity and socio-economic aspects). In addition, mapping of the ecosystem services will be undertaken, which is an easy way to determine synergies and trade-offs between different ecosystem services and shows their spatial distribution. The mapping will form the base to evaluate the restoration project. Such assessment can help in the subsequent management of the ecosystem (e.g. by identifying highly valuable areas). Ramsar Convention Secretariat, 2013. The Ramsar Convention Manual: a guide to the Convention on Wetlands (Ramsar, Iran, 1971), 6th ed. Ramsar Convention Secretariat, Gland, Switzerland. Success or failure of river restoration projects is mainly assessed using variables of structural nature, e.g. the composition of biological assemblages. Functional components, even though widely investigated in ecological studies dealing with aquatic systems, are less commonly used for monitoring the effects of river restoration and the current scientific understanding is still limited. 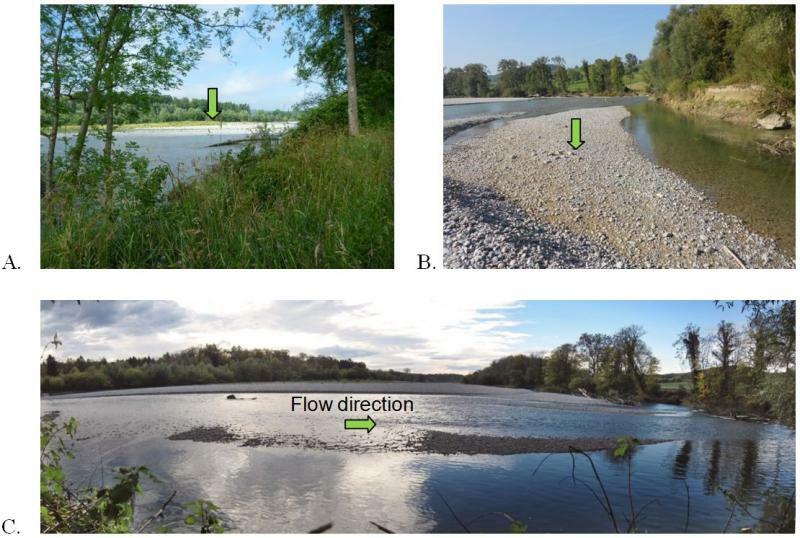 Functional indicators might respond and reveal effects of river restoration in an earlier stage compared to biological assemblages. The general objective of this PhD thesis is to improve the knowledge about effects of river restoration on selected functional components. In particular, effects of river restoration on (1) patterns in the food-web structure and (2) the self-purification potential are investigated. Figure 1: Food web components sampled for stable isotope analysis. 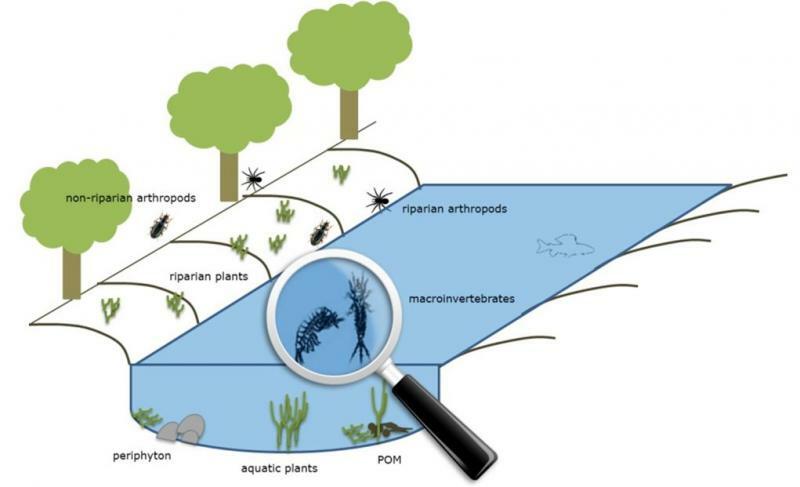 First set of analysis focused on trophic structure of macroinvertebrate communities (figure: Benjamin Kupilas). Figure 2: Injection of a conservative tracer (Amidorhodamin G) (photo: Benjamin Kupilas). In the following, the methods applied to investigate the effects of restoration on patterns in the food-web structure and the self-purification potential are presented. We applied stable isotope analysis (15N and 13C) in context of river restoration. We sampled different components of food webs on paired restored and degraded sections of rivers in 20 different catchments throughout Europe. This set of components will be used to quantitatively characterize patterns in trophic structure on restored and degraded river sections (see e.g. chapter 2.2.1 in http://en.wikipedia.org/wiki/Isotope_analysis  for further explanation on stable isotope analysis (15N and 13C)). 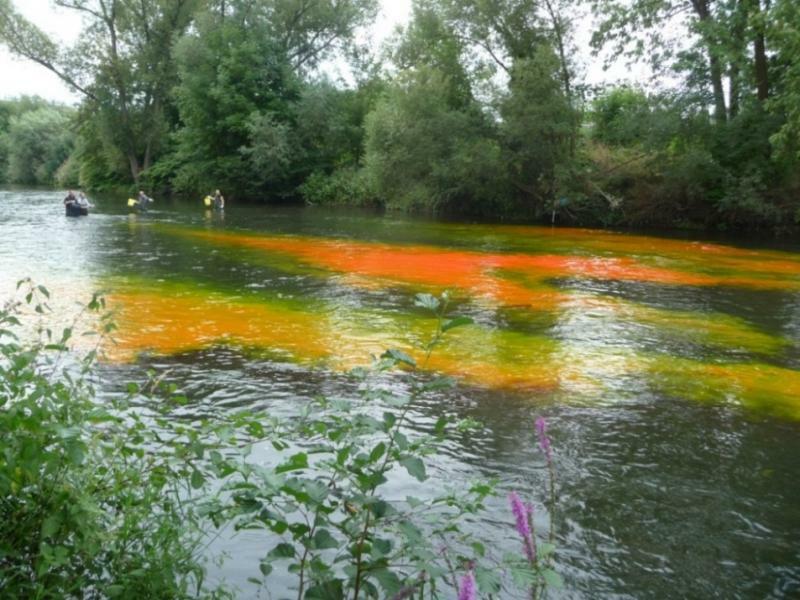 For the investigation of the self-purification potential, we studied paired restored and degraded sections of the river Ruhr in Germany. We used whole-stream metabolism and hydrodynamic characteristics as indicators for self-purification. We measured dissolved O2 and water temperature at the upstream and downstream ends of each section. Other necessary variables (stream morphology, discharge, velocity, barometric pressure and reaeration) were determined in parallel. For the estimation of stream hydrodynamics, we conducted a conservative tracer experiment (Figure 2). Preliminary results concerning food webs show that the dataset is subject to large-scale patterns on European level (latitude, altitude, geology and land use intensity) influencing carbon and nitrogen enrichment (Figure 3). The results underline the necessity to limit comparisons to sites within a region, as large-scale differences mask the effects of restoration on patterns in the food-web structure. The fieldwork on self-purification is almost finished. 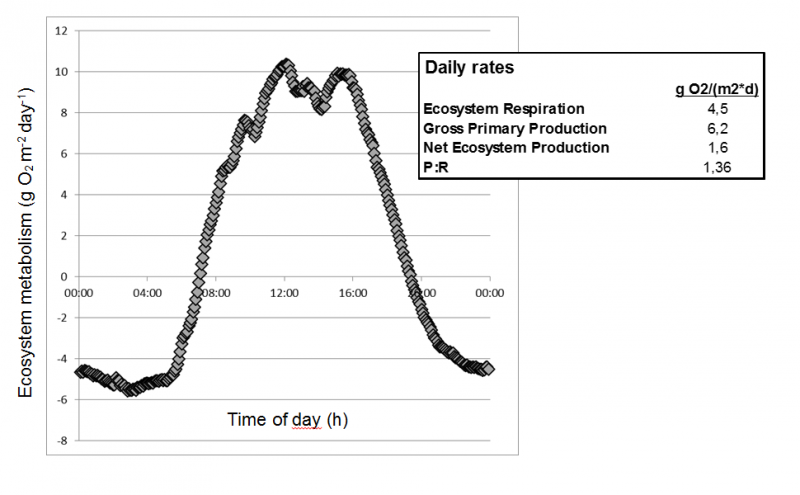 Preliminary results of metabolic rates for a restored section of the river Ruhr indicate high rates of gross primary production and lower rates of community respiration (Figure 4). The calculation of metabolic rates and hydrodynamical characteristics will be completed within the upcoming months. 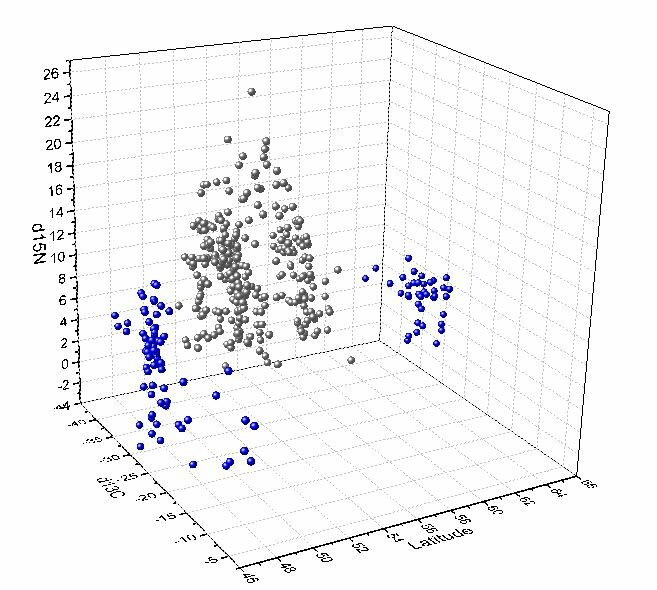 Figure 3: δ13C and δ15N of dataset plotted against latitude (grey: areas with high δ15N-enriched samples; blue: areas with less δ15N-enriched samples) (figure: Benjamin Kupilas). Figure 4: Ecosystem metabolism for a restored section of the river Ruhr (2.3 km) on 10.08.2013 (figure: Benjamin Kupilas). 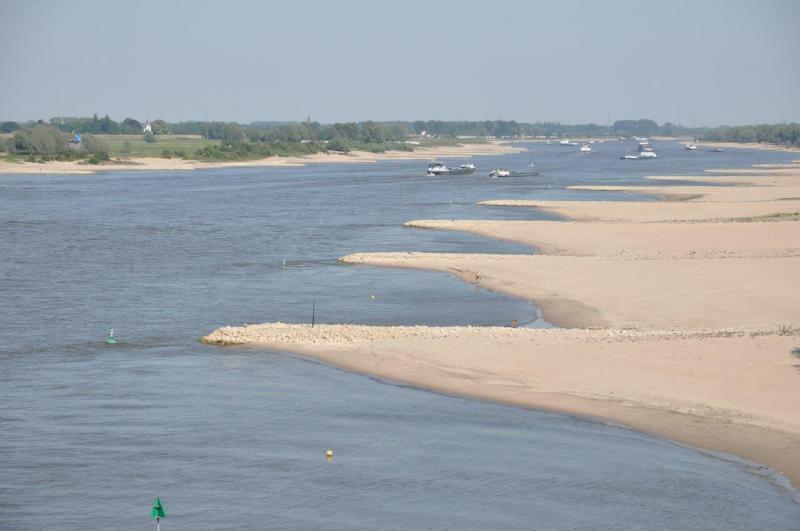 REFORM will host its International Conference on Novel Approaches to Assess and Rehabilitate Modified Rivers (http://reformrivers.eu/events/final-conference ) in Wageningen, The Netherlands, on 30 June to 2 July 2015. We aim for a conference with 200 participants allowing an excellent exchange of experiences and get-to-know each other. For further information about the conference, please consult the website (http://reformrivers.eu/events/final-conference ). The summer school on “Restoring regulated streams linking theory and practice” will take place on 27 June – 29 June addressing students and young researchers before the final conference. The 3-day programme encompasses field visits to stream restoration projects, theory for assessing degradation and plan restoration and drafting a restoration strategy. The number of participants is limited to 30. For further information on the programme and registration, please visit the summer school webpage (http://reformrivers.eu/events/summer-school ). 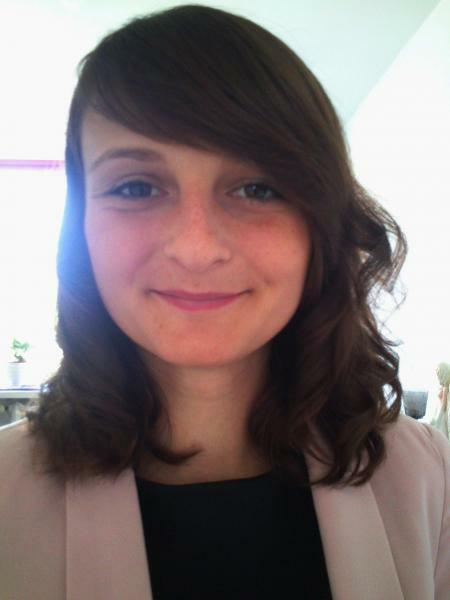 Participants who attended the mid-term stakeholder workshop organized by REFORM (Brussels; February 2013) were generally content with the scope and focus of the REFORM project (see relevant article in our 3rd newsletter ). There were, however, requests to specifically address several additional topics. Out of these, two targeted additional activities were selected: i) the importance of groundwater for river-floodplain ecosystems and ii) the environmental flow assessment in Mediterranean rivers. The activity on groundwater is addressed in this newsletter item. Within SEPA  I am currently involved in Scottish river basin planning. I manage a team of 9 people in the National Water Policy Unit, which is focused on the coordination of our work on water, from river basin management plan production to implementation of measures and legislation development. We also work closely with colleagues across the UK, in the UK Technical Advisory Group on the Water Framework Directive (WFD). At European level, I am involved in the Common Implementation Strategy on the WFD as one of the chairs of the working group ECOSTAT on the ecological quality of surface waters. I have been coordinating the intercalibration exercise on good ecological potential, which of course has quite a big focus on rivers. To help get restoration projects going, we have established a dedicated team in SEPA, known as the Water Environment Fund Unit . The Unit administers funding provided by Scottish Government and running to around 5 million pounds per year. This is supporting initiatives by groups and individuals across the country. 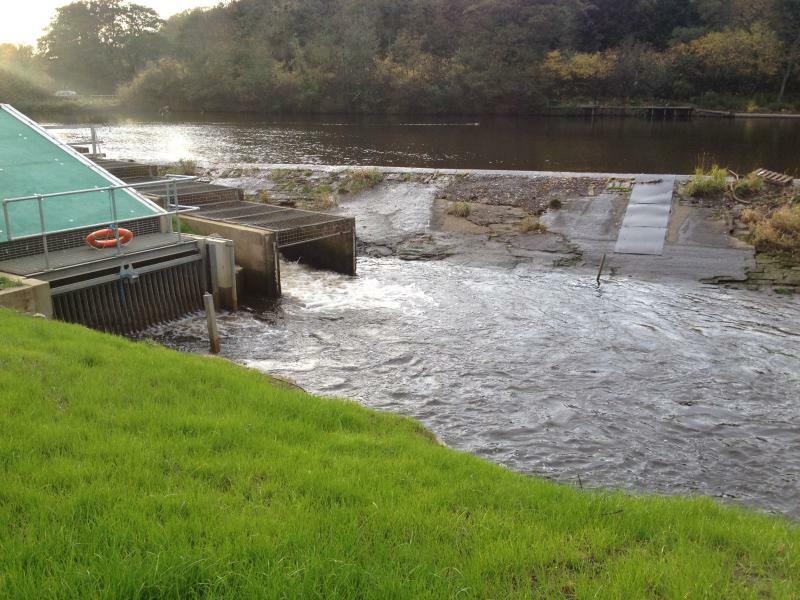 We are also working with local authorities and land managers in four catchment-based pilot projects. The pilots are aimed at demonstrating how improvements to river habitats can be combined with measures that help reduce flood risk. With its source in the Alps and its mouth close to the Rhine falls, the Thur once was a dynamic braided river flowing through the Swiss Plateau. However, to gain arable land and decrease the impacts of floods, most parts of the river were constrained in a straight, unique channel and surrounded by high levees at the end of the 19th century. Since this time, human perception changed and we now understand that human constructions alone cannot prevent the society from floods impacts. Today, in Switzerland a strong political willingness exists to increase the space available for rivers and to rejuvenate their wilderness, with the hope to improve their protecting role against floods and their ecological state at the same time. In 2002, the rehabilitation of the Thur was one of the prominent restoration programmes in Switzerland. Several research projects used this opportunity as a large-scale experiment to increase the understanding about river functioning, e.g. 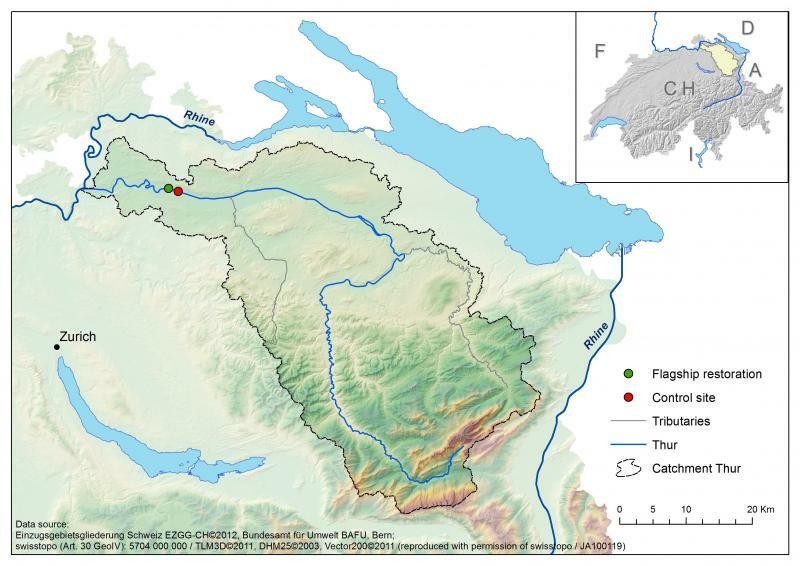 the Rhone-Thur project (Eawag, WSL, ETHZ, EPFL, 2005) and the RECORD project (Schirmer et al. 2014). More than 10 years later it is time to evaluate the mid-term ecological effects of this large restoration project, so it became one of REFORM’s 20 case studies (see figure 1). Figure 1: The Thur river is situated in the north east of Switzerland. 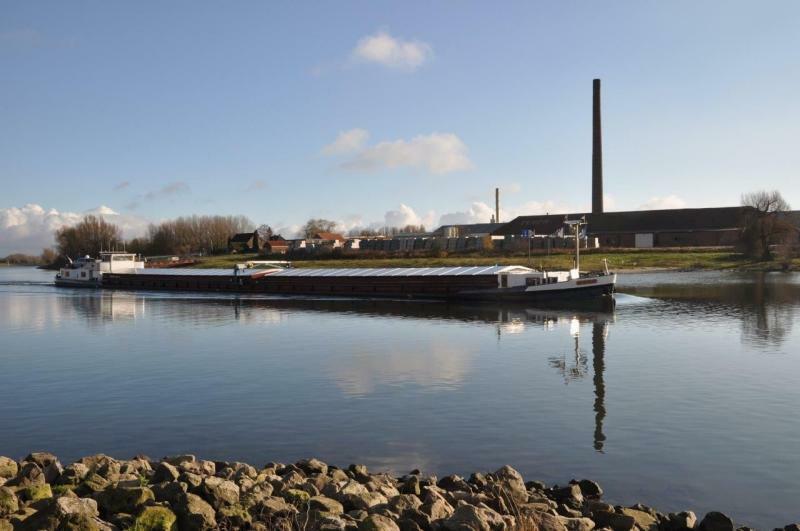 It is a lowland river of 130 km with a 1730 km2 catchment area, and discharges into the Rhine river. It is a river free of dams and artificial reservoirs, showing water level fluctuations close to unregulated alpine rivers. This river has been regulated to serve agricultural and flood protection. Recently in the downstream part a restoration programme was implemented to rehabilitate the river over a distance of 2km (see green dot on the figure). Before river engineering in 1890, the river braided, gravel bars were frequent, islands were present, natural alluvial forest accompanied the river. The complexity and heterogeneity of the habitats were maintained by the natural dynamics of the river itself. Its regulation created a monotonous channel surrounded by high levees and accompanied by embankments which fixed the river. New agricultural land was gained behind the levees for crop production, and between the levees and the embankments for grazing. At the same time, villages and cities were better protected from flood events during which discharge can raise to 1130 m3/sec (in 1999), far from the mean annual flow of 47 m3/sec. The stabilisation of the river bed also permitted to extract drinking water filtrated in the sediment. These human interventions had direct consequences on the hydromorphological conditions, the ecosystem functioning, and its biodiversity. 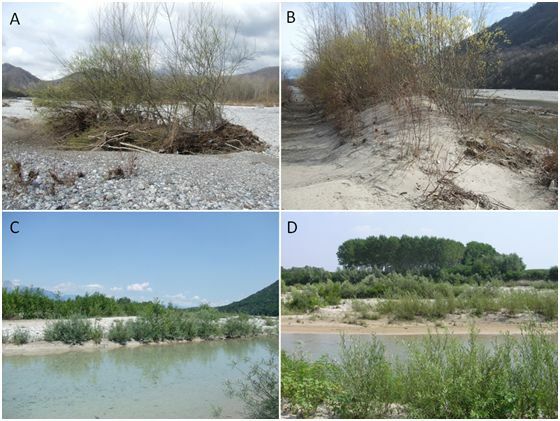 Gravel bars disappeared, secondary channels terrestrialised, characteristic riverine species became rare, floodplain related species disappeared and the complexity of the system was largely reduced (see figure 2). In 2002, a 1,5km section of the river and its floodplain was intensively restored. The river was widened on one side of the main river channel. Embankments along the right side of the river were removed to provide more space to the river in an area where levees were absent already before restoration (see figure 3). Additional artificial structures were added to enhance the ability of the river to braid. The dynamic processes were expected to return, with natural patterns of erosion and deposition, better connection between the main river channel and the floodplain, and recreation of secondary channels. Overall, an increase of instream and terrestrial habitats diversity was expected, leading to an increase in biotic richness and diversity, both in the river and on the banks. Figure 3: Overview case study site A. Recreated gravel bar on the left side of the river (green arrow), and presence of wood within the main river channel. B. Part of the restored site with the main river channel on the left of the photo, a stagnant water body and alluvial forest on the right with gravel bars between (green arrow). C. Downstream view from the middle part of the restored site (photos: A. Paillex and H. Mottaz, Eawag). Measuring restoration success - What comes next? As a result from river restoration, we can observe that gravel bars were recreated, secondary channels appeared, and zones of erosion and deposition now co-exist at the scale of the restored reach. A positive effect of this enhanced naturalness is an increased number of people visiting the river, especially on sunny days. This is supported by an easier access to the river and more opportunities for recreational activities. Less visible, but measurable with appropriate methods, are the biological improvements in the restored reach compared to regulated stretches. The richness in benthic invertebrates, fish, ground beetles, aquatic vegetation and floodplain vegetation has increased in the restored section (see table 1). According to a valuation of richness and of threatened and invasive species, the improvement was important for fish and ground beetles, intermediate for floodplain vegetation, and less significant for benthic invertebrates and aquatic plants. A positive effect is that threatened species (e.g. the fish Chondrostomas nasus) took advantage of this restoration project, while a negative side effect is the occurrence of an invasive aquatic plant in the restored site (i.e. Elodea nuttallii). A combined valuation of biological and morphological conditions indicates an overall positive effect of restoration on the ecological state of the river. However, there is still a lot to do to sustain this improvement for the long term. Today, we may have to prevent invasive species from colonising the recovered habitats, and improve the water quality to increase the biological success. 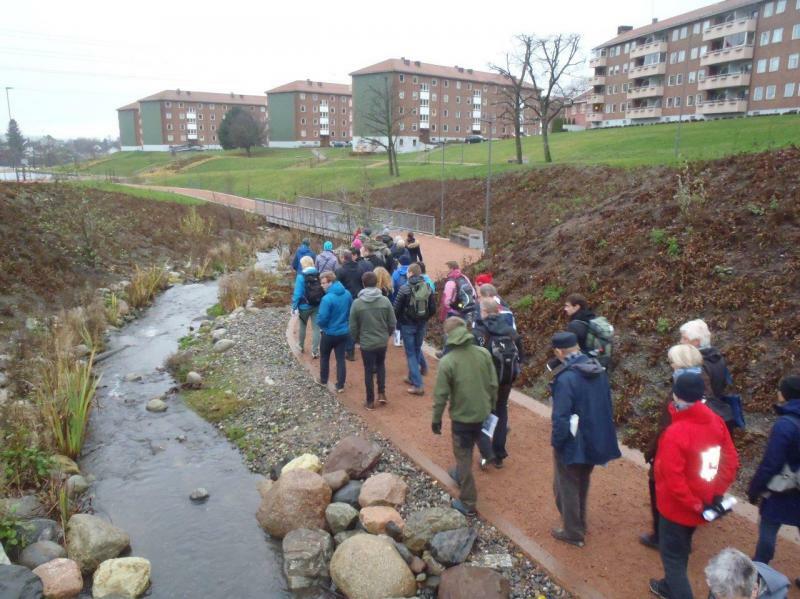 Finally, it is important to recall that this restored part is only 1.5 km long while the majority of the remaining 130 km of the river are still totally embanked. Table 1:Number of taxa observed in a degraded and a restored reach of the Thur river.